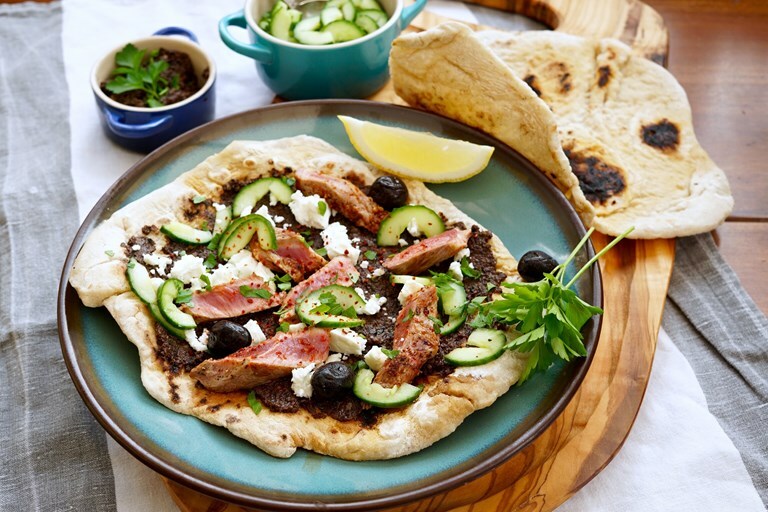 Elly McCausland serves up lamb leg steak flatbreads with a punchy black olive tapenade recipe, with a beautiful freshness provided by quick-pickled cucumber. Serve as they are, or roll up the flatbreads for a tasty wrap – just be prepared for things to get a little messy! When you fancy the delicate, sweet meat of lamb but don’t have time for a roast, lamb leg steaks are perfect. Brushed with a little seasoning, olive oil and chilli, seared in a hot pan and sliced thinly, they make a wonderful addition to many main courses. 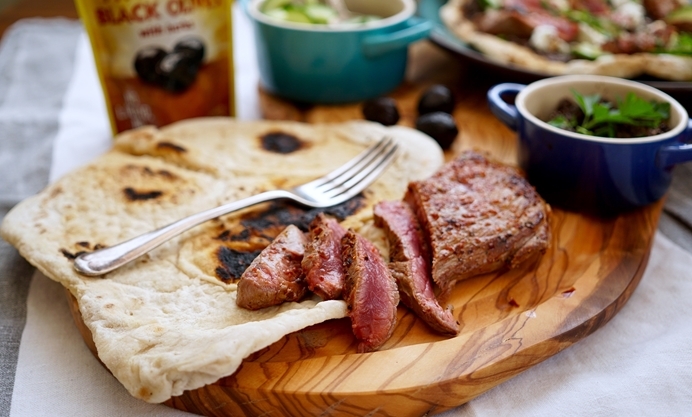 Lamb pairs especially well with other Mediterranean flavours: herbs, soft cheeses, olives. 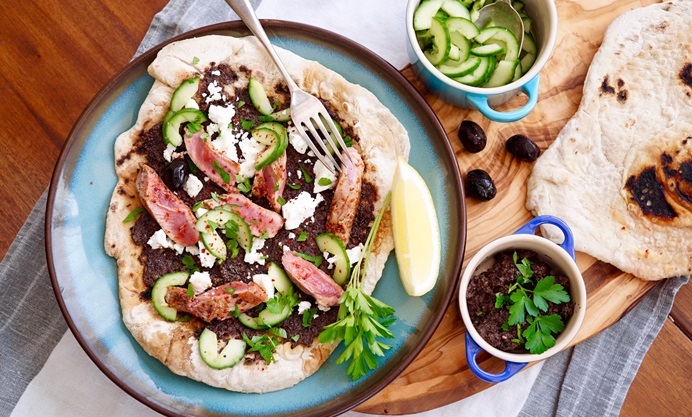 Here, slices of perfectly pink lamb are wrapped in thick flatbreads spread with a deliciously rich, salty black olive tapenade. This comes together in seconds in a food processor, and uses wonderful plump Crespo black olives, enriched with the tang of garlic, lemon juice and capers. These olives are easy to use with no mess – simply pour them straight from the packet into the food processor and enjoy their ripe, bold flavour as you mix in the other ingredients. This olive spread has the unmistakeable aromas of Provence, heady with thyme, anchovies and garlic. It works perfectly with the lamb – garlic and anchovies are traditional partners for the meat - and I’ve added creamy, tangy feta cheese for extra taste and because it also pairs well with the sweetness of lamb. Because this is quite a rich, salty mixture of ingredients, the flatbreads are lightened with a quick-pickled cucumber. The slight sweetness and crunch of the cucumber lifts the whole dish, and adds another lovely texture. These can be served like a pizza, or rolled up and eaten with the hands (it will get messy!) Either way, they’re excellent for a quick but hearty and satisfying lunch or dinner, full of contrasting textures, colours and flavours. Layer over the pieces of cooked lamb, sprinkle with the parsley and serve immediately. You can eat this like a pizza, or roll it up like a wrap – just make sure to keep napkins handy!